The Retractable Banner Stand has become a trade show staple. Weighing only a few pounds, the Retractable Banner Stand delivers stunning results! Retractable Banner Stands come ready to use. Complete with padded carrying cases, these banner stands are durable and project a professional image. I'm standing next to the Retractable Banner Stand for perspective. I stand 6' 2" and weigh in at... (ok, we won't go there), but this banner stand is the real heavy weight. Printed on durable fade resistant substrates, these retractable banner stands far exceed the cheaper vinyl printed banner stands. 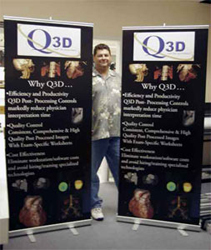 Mike with two, 33.5 wide by 78 inch retractable banner stands. The 33.5" Retractable Banner Stand shown to the right, has a nice color scheme and color coordination. The Banner Stand graphics are well balanced with just the right amount of informative text. For tips on designing your retractable banner stand, see How to make Good Banner Stand Graphics. Special Web Prices for Retractable Banner Stands. Want to see more of our work? I use this site for sending proofs when clients email server or firewall prevent us from sending their proofs. www.GraphicProofs.com. This Retractable Banner Stand is 33.5" wide x 78" tall.